Surfing Crocodile by ANNY I think this turned out pretty, don’t you? Luchessa at Beauty Expression by Luchessa asked me to make a tutorial for my pink mani from yesterday. I like to know if you also want to see tutorials on my blog in the future. Please let me know so that I can work on that 🙂 Any idea or advice is always welcome! 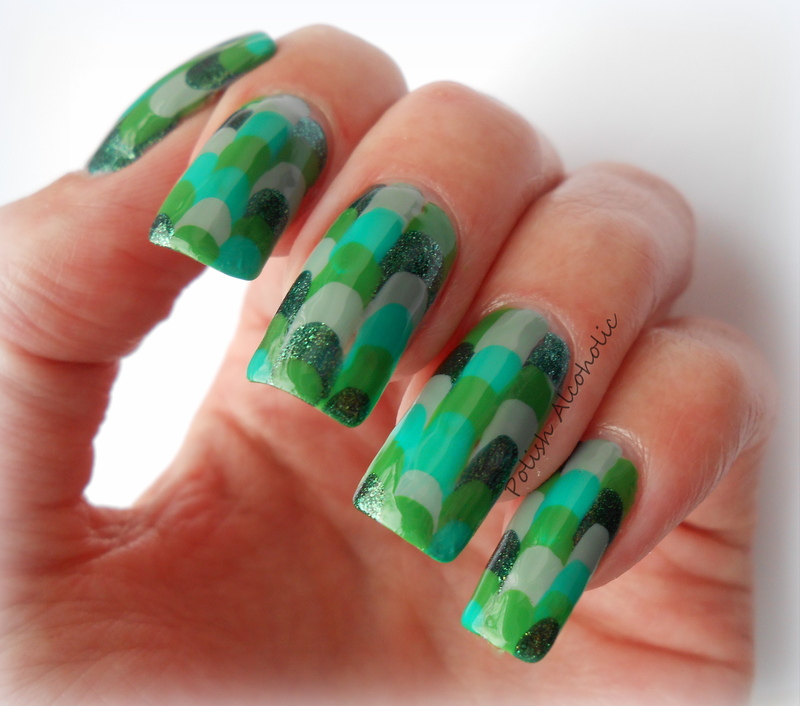 This entry was posted in Challenge, Nail Art and tagged green, green nail art, nail art, pre-spring challenge, pre-spring event by Polish Alcoholic. Bookmark the permalink. Omg that’s so beautiful! I’m literally blown away! Puh lease do a tutorial! I would love to try this maincure esp with pinks and reds! I would love to see tutorials! This mani is so beautiful!! What a beautiful job, so neatly done! You should be proud. I want a tutorial for this one, not nec in a video format, but in step by step pictures:) HOW on earth did you do this ? Oh my goodness, this is AWESOME!!!! Absolutely gorgeous! I’m definitely looking forward to seeing a tutorial on this one. This is amazing. Love the color combos – maybe some day ANNY will market in the USA. I would like to try this – thinking it looks like you have a base and then did over lay long brush strokes. Maybe the base if the dark shimmery green? Sure does not look like you got the polish super thick. Really love this…I agree – I too vote for a photo tutorial! I’ve e-mailed and tweeted ANNY and even contacted them through Facebook, sadly without any response (so far). As soon I have more info, I’ll let you know. I didn’t start with a base color, just a base coat. All the “scales” are painted next to each other, row by row. Beautiful, as usual 🙂 I love the designs you create – if you had a photo tutorial page, I think it would be a great idea! A page? That is the brightest idea of the day! Seriously, that’s distinct and easy to find for everyone. Thanks for the input hun 🙂 Definitely going to work on that! I love this! I always shy away from using different finishes together in nail art, but you’ve made it work really well. Dank je! Wat leuk 😀 Ben benieuwd naar je bloemetjes design! Then you’ll see that it’s easier to do than it looks, trust me! cute! 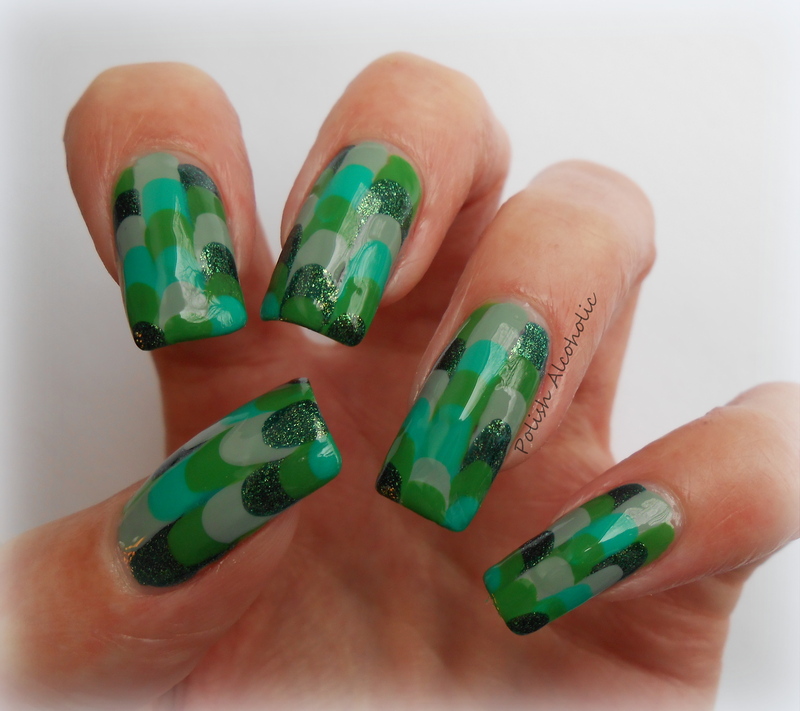 Kind of like mermaid scales!